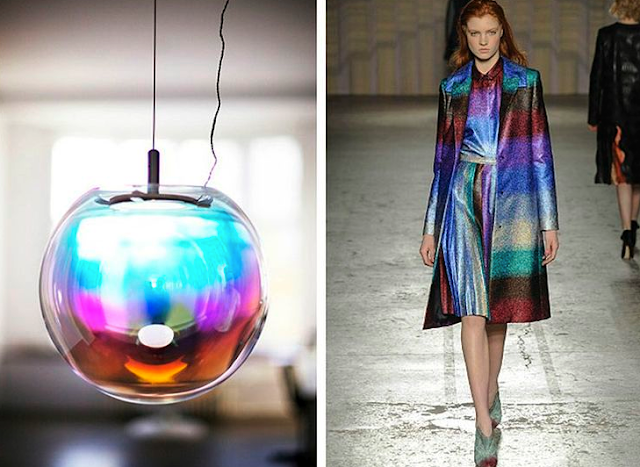 MM Interior Design: FASHION MEETS INTERIORS: IRRESISTIBLE - IRIDESCENCE ! FASHION MEETS INTERIORS: IRRESISTIBLE - IRIDESCENCE ! Nightstand named "Jet Lag" designed by Lena Hemm as part of her first furniture collection. 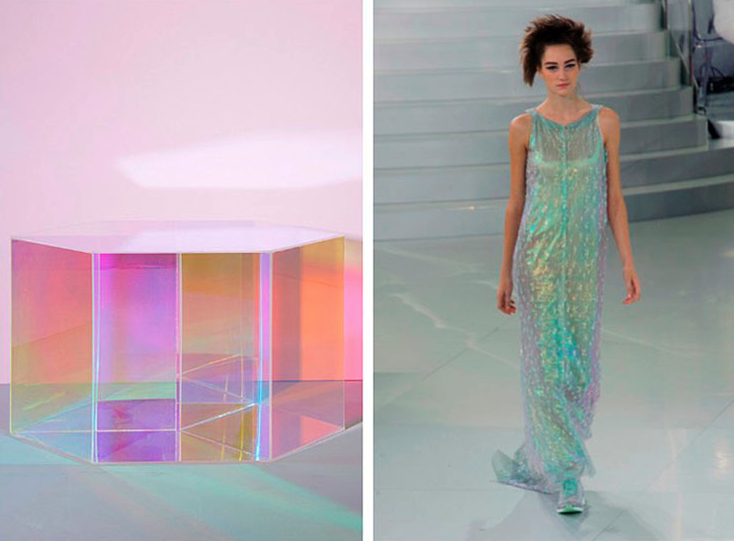 Iridescent shiny dress as part of Chanel's Spring 2015 Haute Couture Runway Show. 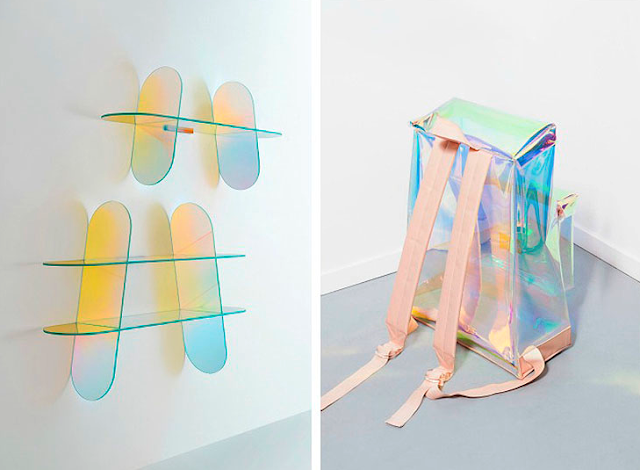 Patricia Urquoila designed these iridescent coated glass shelves called "Shimmer". Eastpack collaborated with designer Sabine Marcelis creating this limited collection back pack. Design Studio Besau-Marguerre has created this 'Iridescent Copper' Mirror. It was inspired by ancient history in the fact that mirrors are as ancient as the need for human to embellish themselves. Originally mirrors were made from various metals and copper. 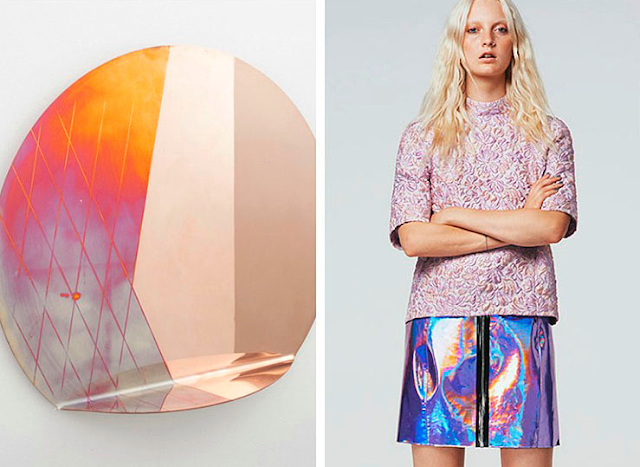 In Markus Lupfer's Spring/ Summer 15 collection, the designer blended metallic with iridescent effects. This handblown crystal lamp with an iridescent coating won German designer Sebastian Schere a Lexus Design Award in 2014. Marco de Vincenzo surprised his audience when he showcased a collection made of shimmer and dazzle.